Another early riser day. As the sun rose over Siem Reap we were in the back of a small pickup truck loaded with passengers and luggage off to catch the 7:30 boat to Battenbang. 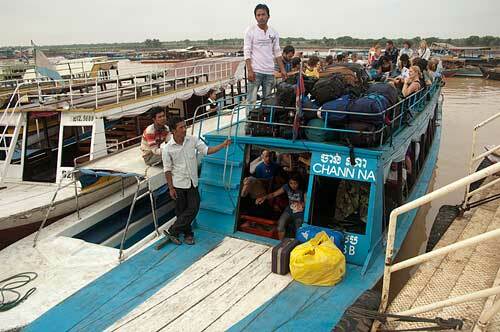 We’d read about this boat ride and heard from other travelers that it was an extraordinary trip. So rather than take the 5 hour bus ride we opted for the 9+ hour boat ride (long because it’s the dry season and the river’s low). We had also heard that safety standards do not apply and sure enough as we boarded the boat we saw that there were definitely not enough life jackets for the number of people aboard. 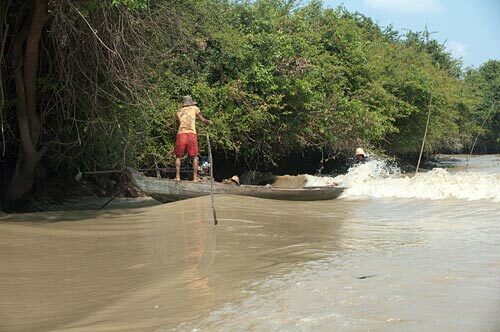 But only the lake, Tonle Sap, would be deep enough to drown in; the river was very shallow, sometimes less than meter. It took less than an hour to reach the NW end of the lake where we entered the mouth of the river and started upstream. 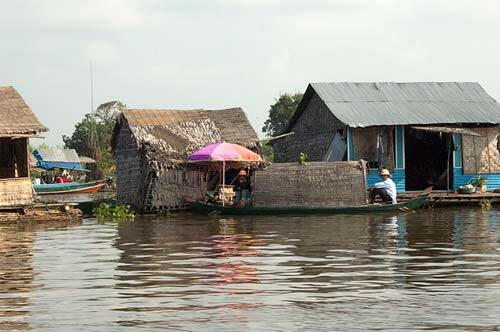 We passed a variety of homes throughout the journey but at this end of the river most of them were float homes. 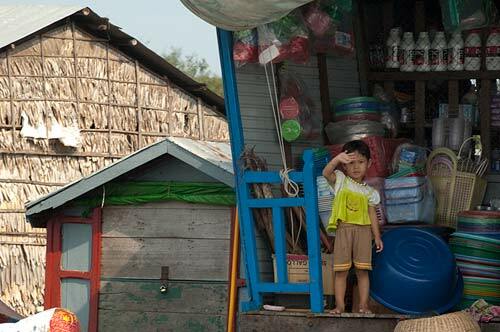 Children smiled and waved, calling out “Hello”s as we passed. It must be a twice-a-day event for them with one passenger boat going upstream and one downstream carrying primarily tourists and a few locals. This trip was without a doubt an awesome experience and I took over 200 photos; but I’ll try to give just a taste of it with a select group. I have many photos of the float homes as they were funky and colorful. I’ve quite a few of the people as they were friendly and frequently close to our boat. And I’ve lots of other passing boats. 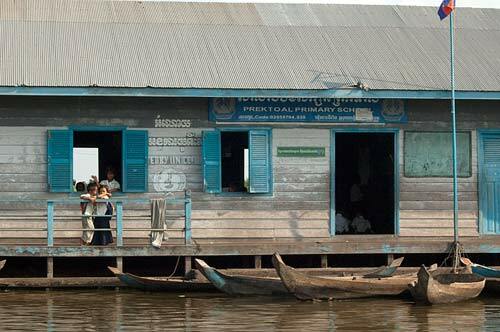 So here we go… up the Sangker on an incredible voyage…..
We passed floating homes, stores, gas stations, churches, police and (above) schools. 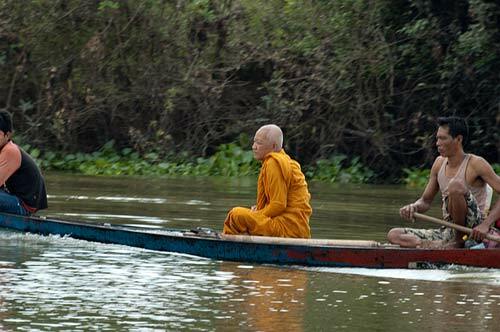 Some boats sped past us, like this one with its monk and his assistant. 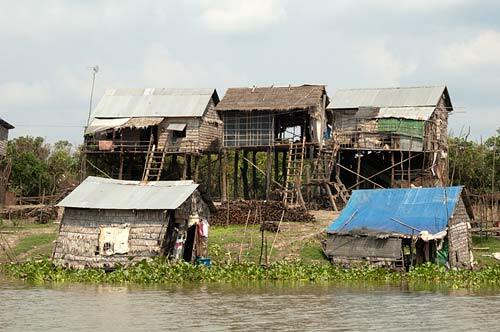 As we progressed upstream more homes started appearing on the riverbank rising above us. Note the stilts. Apparently in the wet season the river’s about 3-4 meters higher! I kept seeing these large wooden cranes and wondered what they were for. 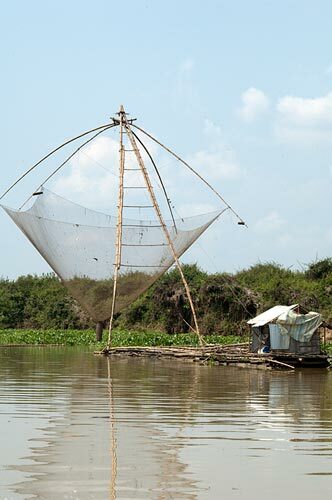 Then we saw some with their load raised; they were used for raising and lowering large fish nets. Note the small basket at the bottom for the fish. The fish we saw were quite small, around 6-9 inches. Often they leapt out of the water as we passed, flashing silver in the bright sunlight. Speaking of sun – the travelers on the roof and the bow were getting quite toasty by now. A few hours into the trip we stopped at a junction in the river where there was a small floating town. There we docked at a floating store where we could buy refreshments and stretch our legs a bit. Also those on the roof could get down and get some shade, some of them seeking seats inside. When we left here the river narrowed a lot. By “a lot” I mean that sometimes we were hitting the brush on the riverbank, sometimes the boat actually rammed the bank as it was caught in the swift current trying to negotiate tight bends. And the water got shallow, very shallow. 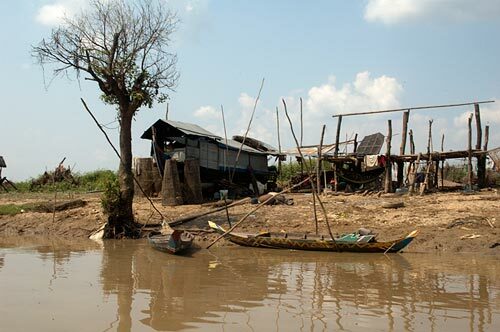 The landscape on the banks started to look much more arid also, and the homes and boats much poorer. 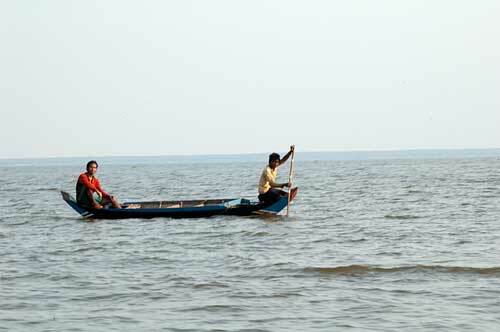 We passed many people fishing: either from boats or standing in the water. Our wake was huge due to the shallow water and we frequently swamped smaller boats. 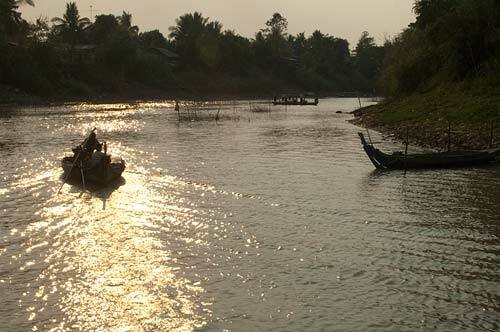 Sometimes, like in the above photo, our wake drove the boats backwards into the bank and the brush. 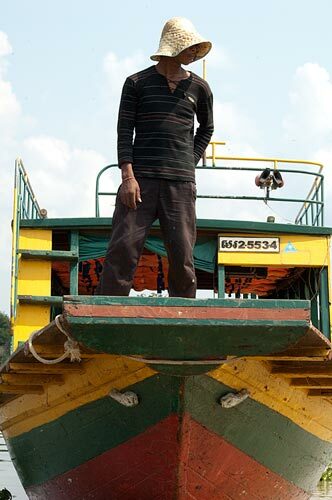 Our driver would slow as much as he could but to keep our boat pointed upstream and to maintain headway he often had to gun it. At one point we actually rammed a fixed fishnet along the bank as the oarsman in the bow frantically tried to push us away from it. We passed an incredible variety of boats but these two represent some of the most common. Note the long shaft coming out from the motor in the boat on the left. The driver would raise and lower the shaft/prop to control the speed of the boat. 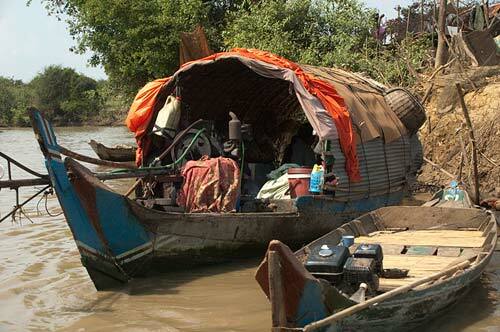 Despite the poverty and poor conditions we did see a number of boats with new looking motors. And here’s our wake ripping along the shore. In the mud of the riverbank we could see holes. We later learned that these were made by rats, who, when the river flooded, vacated the holes by the hundreds and moved up the banks. We also learned that sometimes cobras like to live in the holes, first devouring the rats and then finding a nice cool home. Of course when the river floods they move up the riverbank too. 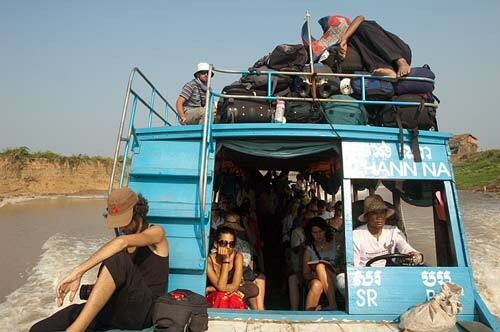 Here’s the crew and a couple of passengers rocking the boat free of a sandbar. Our already noisy engine really got going as the captain gunned it in forward and reverse trying to free us of the bottom. You can see how shallow it is as the men are only up to their knees in the water. We saw many fisherman in the river, many wearing only the briefest of briefs but some, like the fellow above, fully covered. 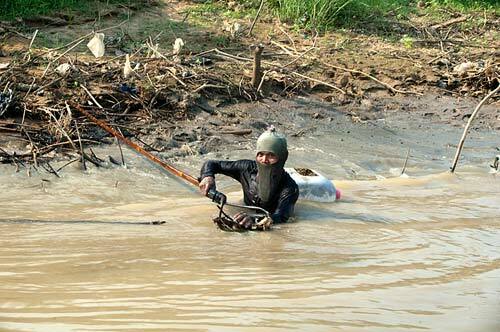 This man’s using a sharpened rake-like tool for spearing the fish. The sun’s getting lower, the passengers are getting baked and tired. The captain’s maintaining his tight grip on the wheel and steering us into the sunset. The river widened again as we approached Battenbang at sunset. Numerous houses lined the banks and children waved from them and from the river where they swam at the day’s end. We left around 8am and we arrived around 6pm; an approximately 10 hour journey. When the river’s high this trip takes 5 hours. But neither of us would have missed it for the world. Even Sue, who spent the next day in bed recovering from heat exhaustion (and we were under the roof!). awesome journey! 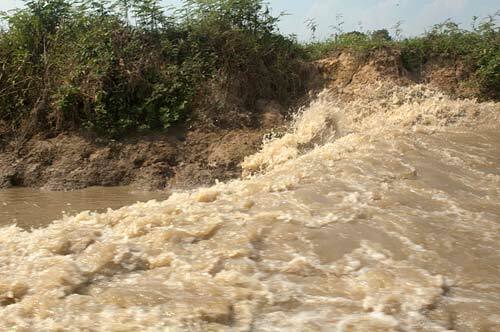 I reckon that when the river is high that it is rainy (monsoon) season for that particular time of Year? Well, at least you had sunny weather during the trip. Stay safe and stay in touch…Best regards; Jud.